Ah, autumn! So much to savor: the ravishing colors of leaves, the scents of simmering soup and cinnamon, the brightness of the days as they grow shorter. In the evening I light some candles and want to change into my pajamas as early as possible and get lost in a book. And I'm especially tempted by the books I've recently received in the mail. I won Unending Devotion by Jody Hedlund and Life with Lily by Mary Ann Kinsinger and Suzanne Woods Fisher on Renee's blog, Black 'n Gold Girl's Book Spot. (I've already read--and enjoyed--Life with Lily; although this book is for children 8 and up, it was my my first taste of Amish fiction, and it's whetted my appetite for more.) Watering Heaven is a collection of short fiction by writer Peter Tieryas Liu (which I hope to review before the end of this year), and Lola's Secret by Monica McInerney is for an upcoming TLC book tour. Mailbox Monday, one of my favorite memes, is hosted by the Mailbox Monday blog this month. What books arrived in your mailbox recently, or from elsewhere? Comments welcomed. I hope everyone in the path of this monstrous storm stays safe! Life with Lily looks cute, I like Amish fiction. Thanks for mentioning your author interview to me, Naida. I just stopped by and it's wonderful. I hope you get to light those candles and relax in your pjs! Enjoy your books! I won Unending Devotion too. Hope all your books are winners. Enjoy all your books, and curling up in your PJs for a long evening of reading. I am retired so I often get into my nightie early in the afternoon and settle in for a long evening of reading. It doesn't get better than that!! Interesting set of books. I didn't know there was a gennre of Amish fiction, although one of my favorite books when I was a kid was Plain Girl by Virginia Sorenson, so maybe I should check out Life with Lily. I only recently learned of this genre myself. I've been fascinated by the Amish people since my childhood. 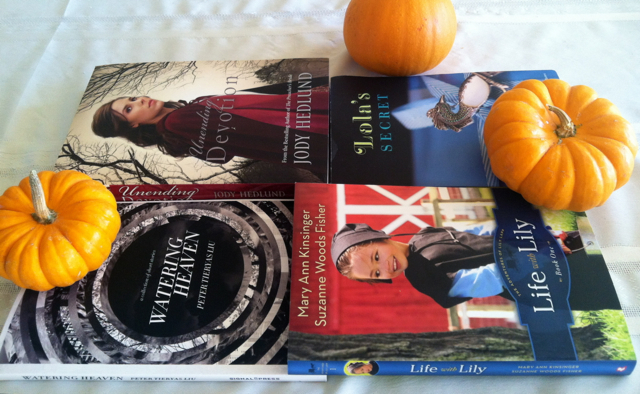 Such a cute picture of your books with the little pumpkins. Hope you enjoy all your new books! Love the tiny pumpkins in the shot! Fun! Nice selection and congrats on the wins. I always enjoy autumn too, I just wish it wasn't followed by winter! I especially like how you photographed your books in such an autumnal setting. These look like great books!! Enjoy your first of November, Suko!! I like the Halloween/autumn layout of your books in the photo. Enjoy the books! I love how you did a photo shoot with pumpkins and all! I love fall as well! There is nothing better than curling up under a blanket with a good book. I hope that you enjoy all of these! !